I sat in the hostel toilet stall doing my usual reading of the notes graciously left behind by the wise folks who had been there before me. I walked into my hostel room where 4 people sit scattered on bunk beds each holding desperately to their laptops and iPhones. It becomes quite clear to me that they are entranced so I don’t disturb their peace and grab my pen and notebook and head for my bed. As I overhear the conversations of those chatting to friends and family, not one of them describes the beautiful mountains that collapse into the cold waters of the Beagle Channel. Not one of them lends a word to spotted snow capped islands that line themselves with an amazing variety of wildlife either. 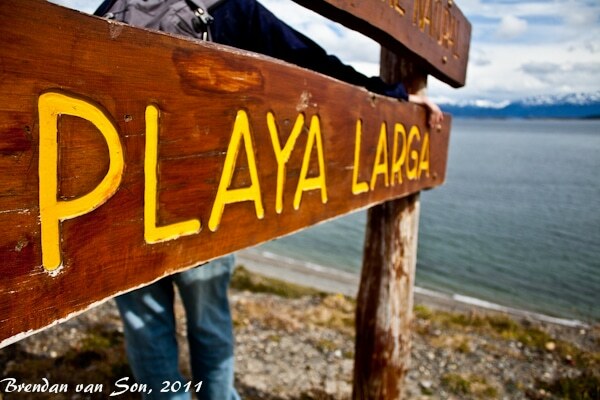 Instead, they seem engrossed en relaying to their friends that they are in the southernmost city in the world, some don’t even mention the city’s name: Ushuaia. It really is something that hadn’t occurred to me, travel for bragging rights. I never once thought, well, I’m going to go to the highest capital city in the world (which I’ve been to), the highest navigable lake (been there too) or the southernmost city in the world (been here as well). That is not my reason for visiting a destination. When I was in Canada I never ever thought of going to the northernmost city. “I’ll bet its bloody cold up there right now,” I think to myself as the chatter between travelers and home bodies continues. I have always had Ushuaia in my travel plans, but only as a hope that I would be able to get to go to Antarctica, but never did it occur to me to travel here for a boy scout’s badge. Having spent nearly two weeks here now I realize that there’s more to this place than the ships that leave to Antarctica each day, the high prices, and the southernmost Irish pub in the world (where I’m proud to say they all know me by name and taste). 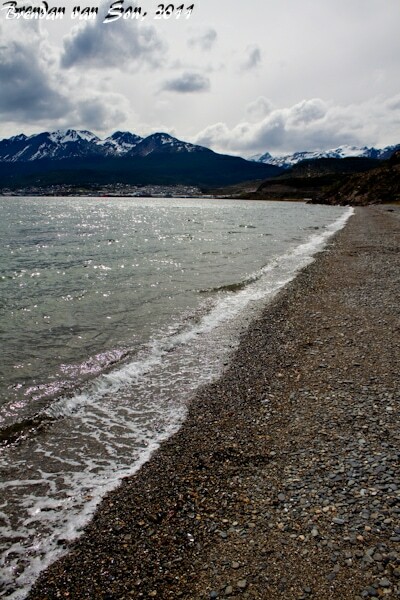 The area of Ushuaia is home to some very stunning landscapes. Just outside of town lay large fjords that spot the treed mountain landscape. The cold coastal waters lead into beaches coated with smooth rocks waiting to be skipped to their homes. The rich islands that dot the Beagle Channel are home to a wealth of life from sea lions, to large birds, to the tuxedo wearing penguins that always have visitors smiling. Travel for whatever reason you may have, even if it is for bragging rights. But in the end, make the best of travel. Take in the destination for its real character and not its position in the record books. Enjoy the view, take in the air through your nose and exhale it with force out of your mouth, and smile at passer-byers. It doesn’t matter if you’re in the southernmost city of the world or your hometown, you’ll grow and gain from your experience. Next ArticleDaily Travel Photo: Get your own! I love how you start this post in the bathroom! I usually start my journeys on the toilet too. It’s a great place to collect your thoughts! It never quite occurred to me to go to the most southern or northern city either. Thanks for the idea. Great summary of your time in Ushuaia! I know a lot of people that travel for bragging rights, and sometimes even to places that they don’t really want to go! Haha. I think there are also some spots that it’s assumed people that are well-traveled SHOULD go. Like Paris, Venice, India, etc. It’s like if you are in a group of people that travels a lot and you haven’t been to one of those key places, there are immediate gasps of disbelief when you answer “No, I haven’t been to [blank].” It’s a really great point that you should travel for your own enjoyment though, no matter the reason. Thanks for the comment Jen. When I talk to people, and they hear of all the places I’ve been, and they hear I’ve never been to Paris, Venice, etc. I always get those looks. Eventually I will get to those places, but I don’t travel to knock sites off a checklist, nor do I have a problem with people who do. In the end, as long as people are having a positive experience it doesn’t matter what your reasons are. When we were in Patagonia we met a lot of “competitive” travelers who would rattle off all the hikes they had done and this and that and make you feel like you had really missed out if you had skipped something. It gets old. Travel because you love it and learn something from it, not to tick off more places off a checklist. Enjoy Antarctica! It’s freakin’ amazing. Totally agree… I did the Torres del Paine W in 4 days and people kept saying… ooo you should have done it in 5, you must have mist things. Or, well I did the Q. Lol, it gets old quick the travel for bragging rights. I’m going to go through your page for some pre-antarctica inspiration right now I think! Ya, it’s definitely more than I expected it to be. I really did think that the only reason people would come down here was to say they did, but it’s really beautiful! Damn, I had never thought about travelling for bragging rights. Ive always looked at it as I just wanna visit every where. Hmmm now that I am starting my RTW trip I may start doing so… jk that would be tacky. I feel like people who travel for bragging rights are the type that are always in search of the next best destination, thereby missing the entire point of travel-so soak it all in and learn something about yourself and our world. They become these “travelholics” ……and usually anything ending in “holic” doesn’t turn out very well! yeah but when you are an old man in the twilight of your days bouncing a toddler on your knee (on a rocking chair, on a porch? ) you will have bragging rights to weave into tales of adventure!